I'm working my way through my Goodreads "To Read" list and can't remember when or why I added Fish Girl, but I'm glad I read it. This strange middle grade graphic novel was an interesting read. A nameless mermaid in a boardwalk fun house spends her life obeying what Neptune tells her to do: give the tourists a glimpse but never a full look, and collect the coins they leave. It's all she knows until one day she makes a friend with a regular girl. This opens her eyes to the reality of her situation and makes the mermaid decide to escape her tank and see what the world is like. The relationship between Neptune and the mermaid is worth discussing; in order to stay safe, she must do what he says. This is clearly a commentary on abuse and power, written in a way that can be discussed with young readers on a variety of levels. David Wiesner's illustrations are beautiful and capture the imagination. I loved seeing the building cut in half and inspecting the mechanics of how the fun house operated. I know my students will enjoy the fish girl's bedroom, which looks like a normal room except it is full of fish and seaweed. 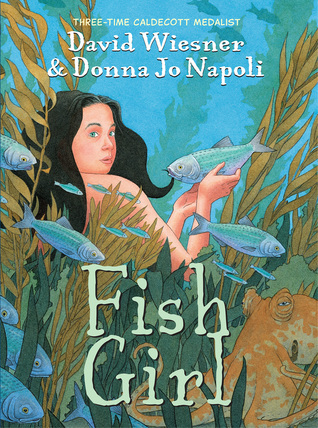 I would be sure to keep a copy of Wiesner's Flotsam on the shelf next to Fish Girl, to entice students who enjoy this artist. There is so much the reader doesn't know--why can't the mermaid speak? What happens to her fins out of water? How can the octopus change shape? What happens at the end of the novel? These questions could be frustrating to readers, but could also be the catalyst for speculative writing. I hope to nudge my students who read this book towards the latter.